I’ve watched a lot of Hell’s Kitchen on TV. That means I’ve watched a lot of Chef Gordon Ramsay yelling and cussing out many wannabe chefs due to their culinary failures. It also means that I’ve seen Beef Wellington served and prepared an absurd number of times in one setting. Aside from the fact that it looks delicious, I’ve always been afraid to try making it because of how many times people on Hell’s Kitchen screw it up. A friend of mine somewhat recently made Beef Wellington using a recipe from Serious Eats. He tweaked it a bit, but reported that it was one of the best things he ever made. He then told me that he got a really nice cut of beef tenderloin. When I asked how much the tenderloin cost and he told me, I asked again because I couldn’t believe how expensive it was! I’m sure the recipe tastes amazing and that Beef Wellington very well may be worth it, but the price tag definitely makes you think twice about having it as an everyday meal. Keeping in mind that my friend testified that a Beef Wellington was easy to make and the price tag of his endeavor, I decided to try something a little different. I thought that I could probably make a Wellington using a pork tenderloin instead of a beef tenderloin and that would accomplish two things. First, I could get in some Wellington practice and second, I could get in that practice without ruining a very expensive piece of meat! After doing a little bit of research, I found a good estimate for a cooking time and that apparently almost everyone wraps their Pork Wellingtons in prosciutto. Normally, I would like to try something different, but why on Earth would I say no to prosciutto? 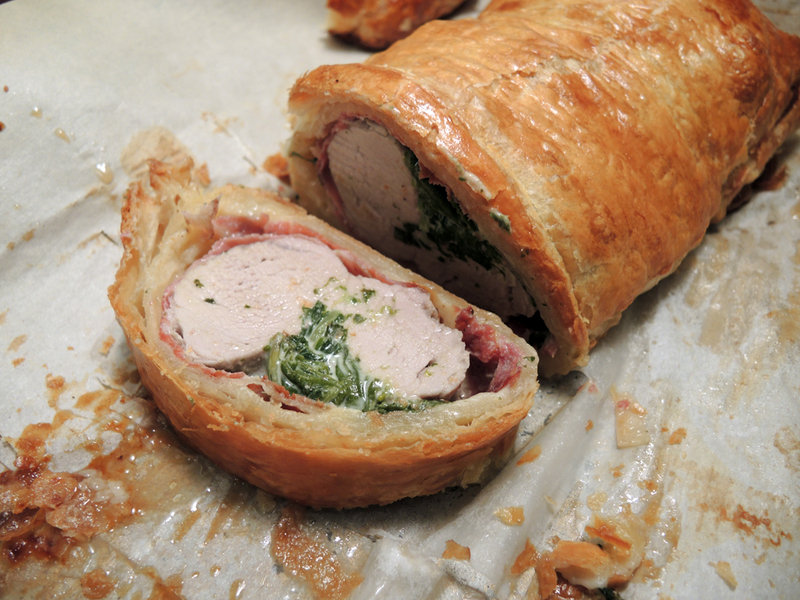 I also wanted to stuff the Wellington so that it wasn’t just pork on pork resulting in a high class pig in a blanket. I may not have been the first to use greens and Boursin cheese to stuff a pork tenderloin, but I am pretty pleased that I came up with it on my own. The result surprised me because it turned out amazingly well and I know that I will keep making this again and again! Disclaimer: Just a note about the recipe below. I originally bought the smallest tenderloin I could find and it was 2 pounds. As it turns out, I actually ended up buying two 1-pound tenderloins stuffed into one package. Some of the pictures below have two tenderloins in them, but that’s only because I decided to make two with what I had. The measurements below are for one Pork Wellington though, so if you’re making two then double everything. Click here for my mini Beef Wellington Recipe! Makes about 8 full servings of about 290 calories each. 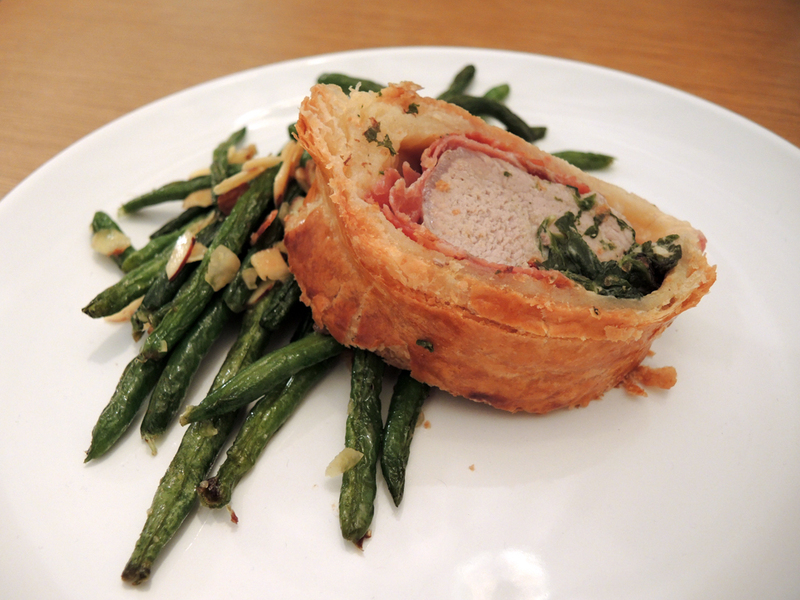 Pork Wellington with prosciutto, spinach, and cheese served with oven roasted green beans. 16 or 17 oz. (1 pound) or 1 box (2 sheets) of puff pastry (about 160 cal. per 1/6 sheet or 1920 cal. total) Note: I used both sheets in one box, but if you can manage to use one sheet, then I urge you to try that to cut out 960 calories! Follow the thawing directions on the puff pastry box and make sure the pastry is thawed before you start. 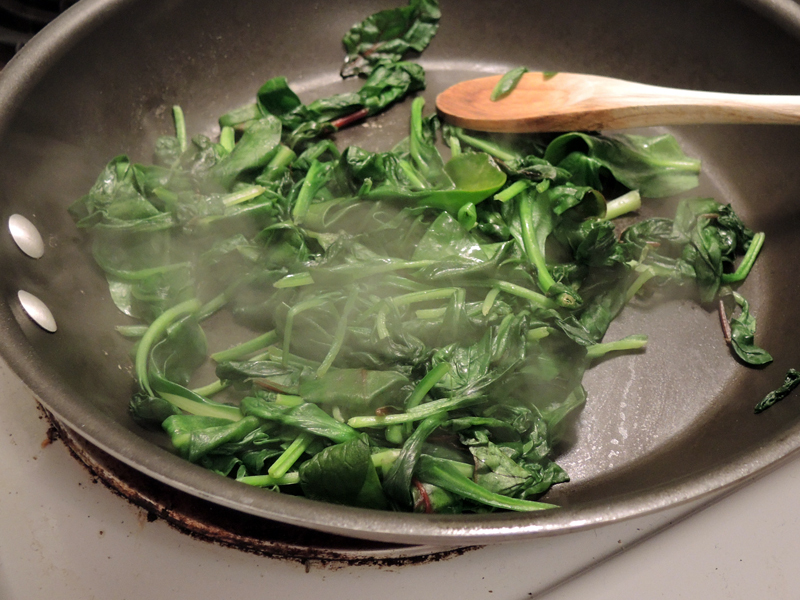 Place two cups of packed leafy greens into a large non-stick pan set on medium heat. Please note that what you see above is a double portion of the greens because I made two Wellingtons. 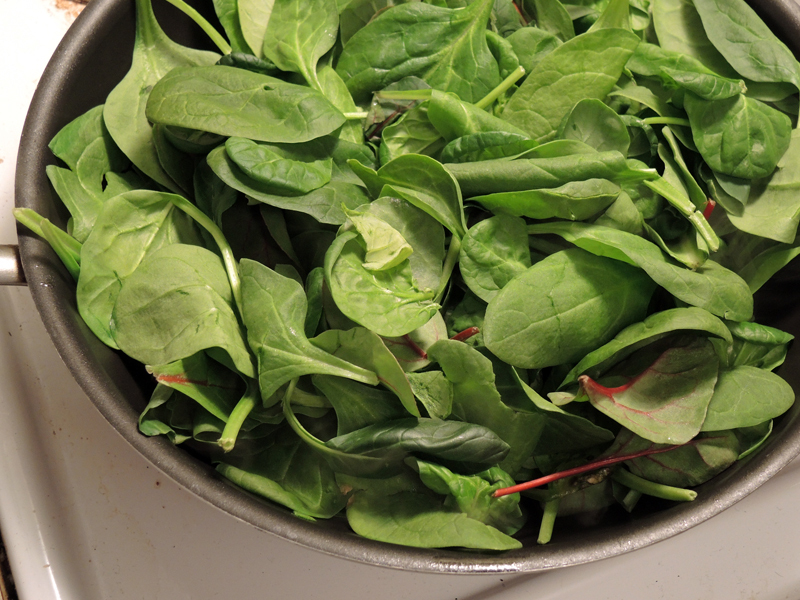 Wilt the greens by stirring them occasionally until they are soft, but not burned or browned. Remove the greens into a bowl and then let them cool a bit. On a cutting board, trim the excess fat off of the tenderloin (go ahead and remove the silverskin if you want, but don’t waste a lot of time with it). Then cut a slit into the tenderloin right down the middle. Don’t cut all the way to the other side. Just cut enough to create a shallow groove. Ignore the second tenderloin in the photo and my poor knife skills. In the bowl with the warm greens, add the Boursin cheese, and mix the ingredients thoroughly. Again, this is a double amount, so yours will look like less than this. 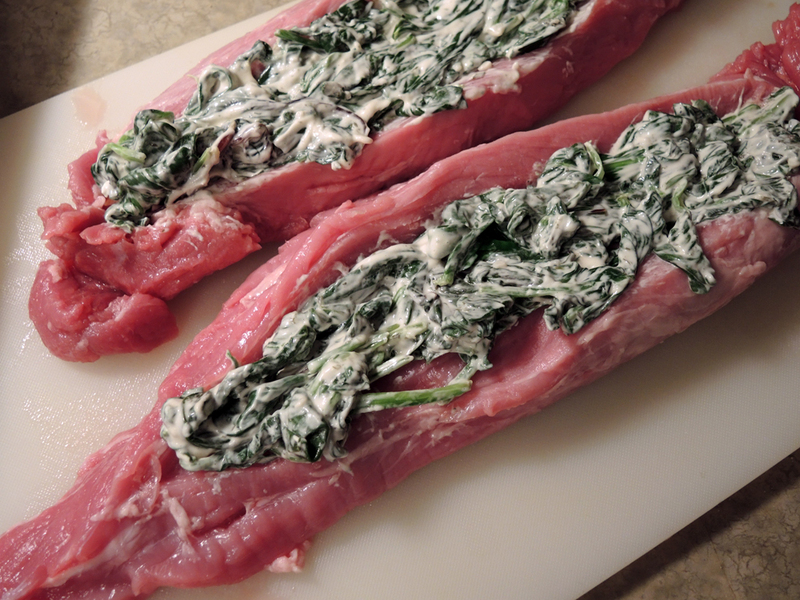 Next, use a spoon or even your hands to start stuffing the butterflied pork tenderloin with the greens and cheese mixture. Unless, you’re doing a double recipe, ignore that second tenderloin! Once rolled in prosciutto (Yes! ), heat a large, non-stick frying pan to medium-high heat. When the pan is hot, carefully add the tenderloin to the pan and sear it all over. About 1 or 2 minutes a side. The tenderloin might shrink a bit as well as the prosciutto, so you might start seeing some of the stuffing pop out, but don’t worry. Just keep searing while carefully turning the tenderloin. Remove the tenderloin from the heat and carefully set it aside. Roll out the puff pastry sheets onto a large piece of parchment paper over a baking sheet and then place the tenderloin at one edge of the pastry and roll it up. Start by rolling it length-wise and then folding over any excess pastry at either end after you are done rolling. Try and make sure that all of the seams are on the bottom. One more tip is to make sure that you don’t put too much pressure on the pastry in general or it won’t puff up, so only press down on the seams to create a good seal. As I mentioned above, if you can use less puff pastry, but still get a good sealed covering then please try and do so. 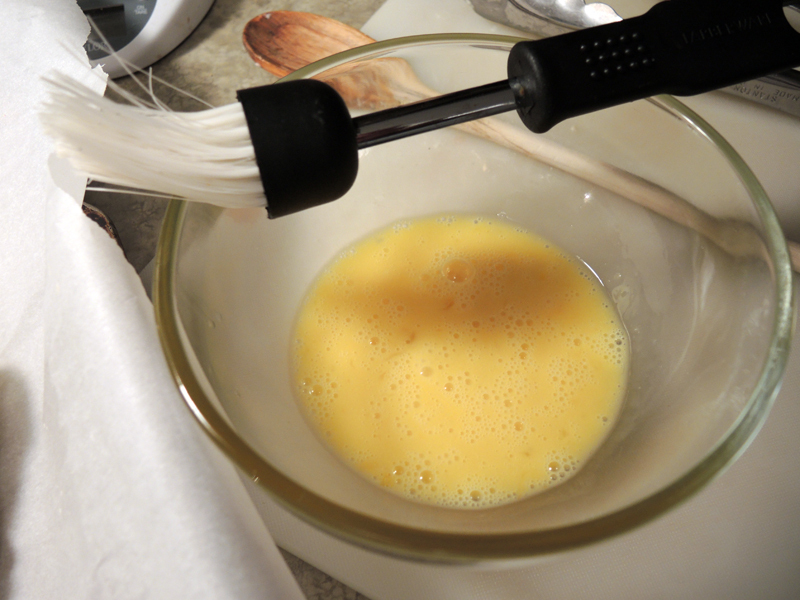 In a small bowl, crack an egg and whisk it thoroughly with a fork to create an egg wash. 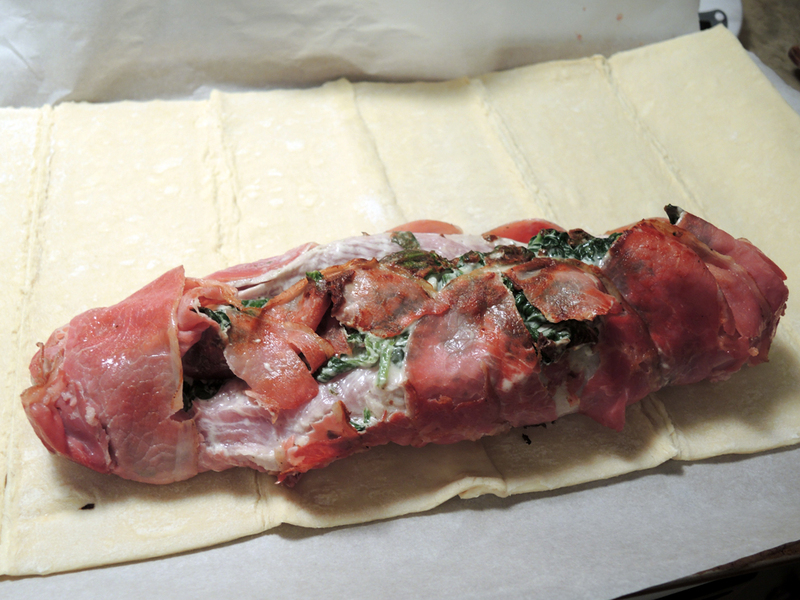 Using a pastry brush, liberally cover the puff pastry that wraps the pork tenderloin. Place the Wellington into the oven on the lower third or lower middle rack and bake for 40 minutes. After 40 minutes (or when the Wellington looks beautifully browned), open the oven, take out the Wellington and check the internal temperature using a meat thermometer by poking it through the top center. If the temperature is between 150 and 165 degrees F, then it’s done. 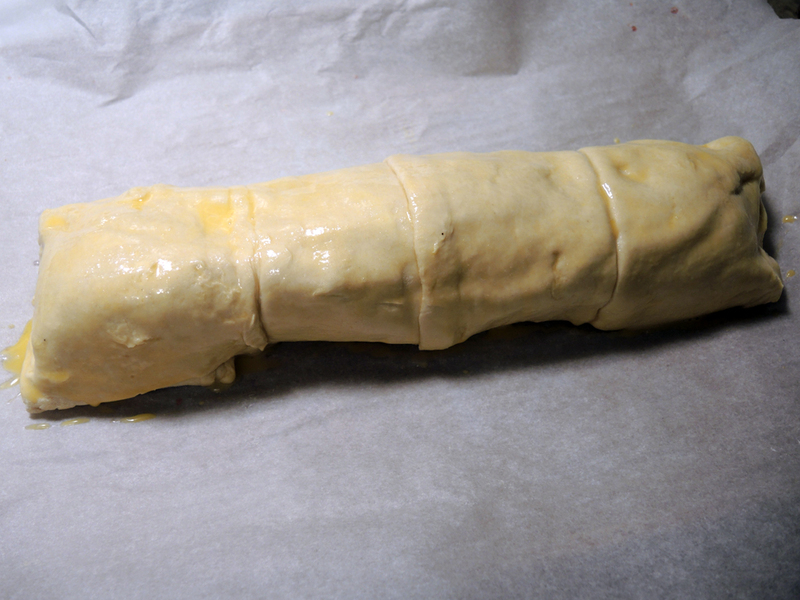 Let the Wellington sit for at least 10 minutes before slicing using a long, sharp, serrated knife. Don’t press down too hard with the knife, but instead let the weight of your hand apply the pressure as you carefully saw through the wellington to make a perfect cut. Practice on the ends first, which will usually just be pieces of puff pastry that you should cut off anyway. Plate and serve immediately with your favorite side dish(es). I served my pork Wellington with oven-roasted, seasoned green beans and sliced almonds (in fact I cooked the green beans a the same time as the Wellington). If you’d like to pair this with some green beans, then check out my recipe. That’s some man food alright. Always wanted to make beef wellington … maybe this pork version will finally give me the kick I need. Can I use a bigger tenderloin, say 2-2.5 lbs? Hi! You can definitely use a 2 pound tenderloin. You won’t need to double the recipe, but you may need a bit more of some of the ingredients such as the puff pastry, filling, and proscuitto. The only other thing is to use a meat thermometer to check the temp of the tenderloin. I know the recipe cooks 1 pound in 30-40 minutes, but two pounds will take a little longer, so it’s best to check the temperature after 40 min. If it’s around 150 degrees F, you’re in good shape! Would there be a way to alter the recipe for a pork loin roast? I thought I had a tenderloin, but now I see how different cuts of meat they are! Thank you! Hi Liana! You’re right that those are two very different cuts of meat. What I would suggest if you’re up for experimenting is to cut the loin roast in half length-wise (I’m assuming it’s a shorter cut with a thicker diameter than a pork tenderloin). That will reduce it’s diameter and if you line up the pieces end to end, you can mimic a longer piece of meat for the recipe. Reducing the thickness will also keep a similar cook time. 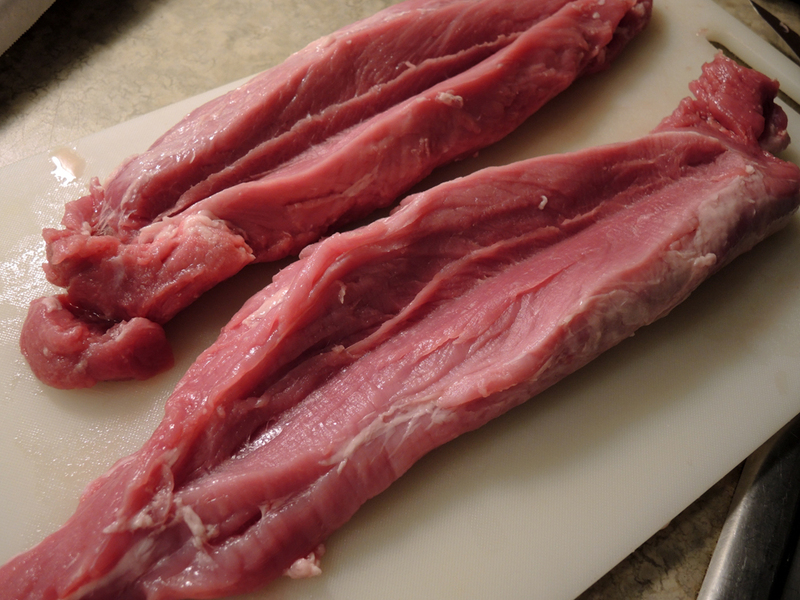 Optionally, you may also want to trim the fat off of the pork loin roast if you see it has a significant fat cap. Normally, I wouldn’t say to do this because fat is awesome, but for a wellington, we often use leaner pieces of meat so that the dish doesn’t get overly greasy. Use a meat thermometer to get the temperature inside correct. Those are my suggestions. I hope they help! Please let me know how it turns out if you do decide to experiment! I had this last year on the night before Thanksgiving at the home of my sister-in-law, and it was so good. I’m making it this year for my guests. Awesome! I’m glad it made an impression and that it’s getting a repeat performance. I’ve got a 10 lb. pork loin, what size should I cut the portions into? Most recipes I’ve researched suggest 4oz. size portions. This will be my first time making wellingtons, doing so for Christmas dinner for my family means I have to get it right the first time. Hi Denise. Thanks for stopping by. Unfortunately, a pork loin is very different cut than a pork tenderloin. What you have (I think) is a pork loin roast or pork sirloin since it’s 10 pounds or so. That cut of meat isn’t really ideal for a Wellington because it requires a low and slow cook method (not slow cooker) to make it tender. Braising is especially good for a pork loin. If you try and make it according to my recipe above, I’m afraid you’ll end up with some really tough meat. 1) Freeze the pork loin you have using plastic zipper bags with the air taken out as much as possible or using a vacuum sealer so you can use the meat at a later date. Then purchase pork tenderloins for this recipe to make for Christmas dinner. 2) You could attempt to cook the pork loin low and slow using a braising method in a Dutch oven instead of using this recipe. There are many French recipes that are fantastic. 3) The last option, which I don’t really recommend is to try cooking the pork loin with a simple braise and then use the cooked meat to assemble the Wellington according to the recipe. 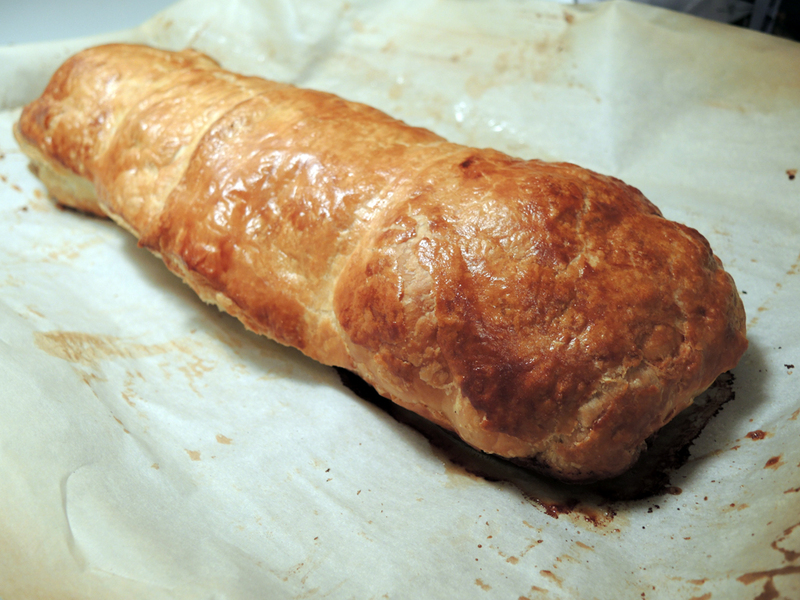 You would just pull the Wellington out of the oven as soon as the pastry was a deep golden brown. I hope some of that is helpful. Good luck! I apologize, it is a pork tenderloin. I purchased it at sam’s club (hence the size) I didn’t have them butcher it for me like I usually do. In that case, I would try and get it into 1 pound (16 oz) increments lengthwise if possible. That would make 10 wellingtons! Wow. I haven’t worked with a tenderloin that size before, but ideally, you can get a nice long Wellington and then cut slices for it for guests. I think 4 oz. size portions would be too small unless you wanted to make individual or personal wellingtons for your guests. What about a good sauce/ gravy? Would a Maderia sauce be good ? Hi Terri! A Madeira is interesting and might work, but I usually think of that more with beef or red meat. The herbed Boursin cheese adds plenty of flavor, so while a sauce could compliment the Wellington, you don’t really need one. Nonetheless, if you would like a sauce, maybe a white wine, herb, and mushroom sauce could work. Or even a creamy black pepper (and/or mushroom) sauce. If you choose to go with a sauce, I might actually recommend skipping the Boursin cheese altogether. That would give you more options since you aren’t limited by what would go with the spinach and herb cheese.